"Bad company corrupts good morals” has been proven true through the ages. 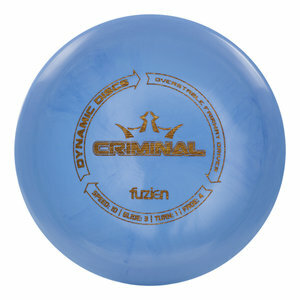 However, Dynamic Discs is bringing you a Criminal that you are going to want to get to know. With more glide than the Felon and more stability than the Convict, this Criminal is exactly what you need to assault your high scores. The fairway driver that will be able to trust to cover the ground necessary without giving up the stability you need for confident throws. Befriend this Criminal and you will start to do some bad things to your course.